My participation in JTFGB has taught me about philanthropy, how to infuse it into my life on a daily basis and how to become a leader in my own community. The word “philanthropy” at its core breaks down into “the love of humanity.” How do teenagers in the 21st century create the space in their lives for this extremely important concept, considering we are always going, going, going 24 hours a day, seven days a week? 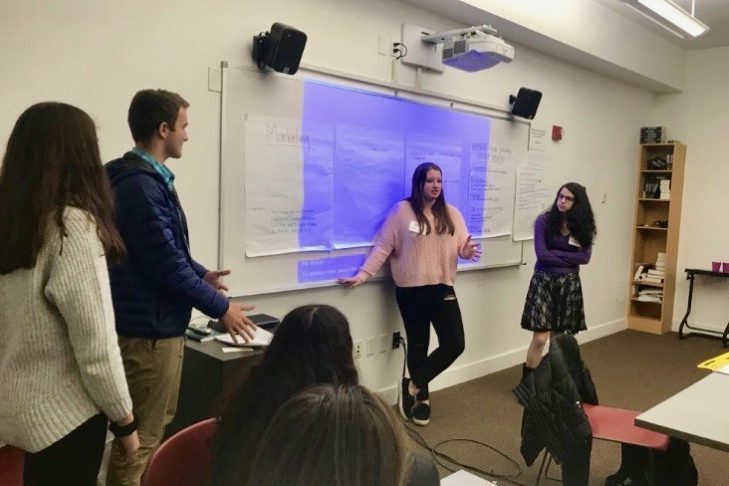 The Jewish Teen Foundation of Greater Boston (JTFGB) has taught me the importance of making room for philanthropy and furthermore the power of incorporating gemilut chasadim, or acts of loving kindness, in our busy lives. Learning about philanthropy and participating actively in an organic selfless endeavor enables teens to can gain perspective on the world beyond the usual confines of their homes, schools, synagogues and extracurricular activities. It is easy for all of us to get comfortable with our local surroundings and environment, but we also need to push ourselves to the boundaries of our comfort zones. As I’ve spent time in JTFGB, I have realized that I am able to travel a short 10 minutes away and be in a totally different place both economically and socially. I have learned that this divide only gets more noticeable and often severe (in different neighborhoods and communities) throughout the world as the geographic distance widens between my home, culture and religion and that of others. During my time within this program, I am in the process of gaining a better sense of this divide in the world and the pressing issues that are in need of attention and change. Pursuing philanthropy has been an amazing way to acquire leadership skills as I’ve transitioned into becoming a real leader in my community. Taking what I’ve learned in this program has made me mindful of people who, for example, are less fortunate than myself. With that in mind, I am aware of my privilege, and I use this awareness to motivate others to participate in efforts to make the changes I realize are needed. I am finding a way to combine my privilege with my leadership skills and put them to use for the better—particularly around my peers—so I can be there to help teach them. Philanthropy in the public sense has predisposed me to embrace doing good deeds in my own daily routine as I strive to make sure I am doing at least one mitzvah a day. To be more specific, I try to make a conscious effort to take a moment out of each day to take a break from what I am doing and do a good deed for someone else—even if it’s something that may seem small. Whether it be reading over my friend’s essay and making editing suggestions, asking my mom if she needs help preparing dinner or stopping by a neighbor’s house after Shabbat services to see if I can help take their small kids out to the playground to give the parents a break, I try to remember to do something that is exclusively for someone else. My involvement with JTFGB over the past two years has motivated me to do things for others and incorporate this idea into my life more so than I ever had before. Perhaps the most valuable lesson I have and am continuing to learn through JTFGB is about what philanthropy really is. Before participating in the program, I had this vague idea that a philanthropist was someone who donated large amounts of money to an organization. What I have learned is that such acts of generosity are not the only element of philanthropy. Philanthropy, this love of fellow human beings, also means identifying the places in society and humanity that need help, working to bring people together to address those problems, making others aware of the problematic situations and targeting whatever resources are available to bring about solutions and change. Yes, philanthropy may include the donations with money that we get to take part in firsthand—but that is certainly not all of it. I have learned that philanthropy can also be as simple as donating one’s time or resources. JTGFB has shown me that there are many organizations which give people the opportunity to donate their time and make a difference just by volunteering. For example, one organization that I have recently become deeply connected to that gives me the opportunity to donate my time is Gateways. Gateways gives Jewish children who have a wide variety of special needs the opportunity to get an inclusive Jewish education through many different learning approaches—depending on the need of the individual. Spending time with these children gives me joy and fulfillment every time I go. Volunteering with Gateways provides an unparalleled opportunity to do something I love while giving back to my community. Even though I am not writing a check, I am still contributing to my community in a positive way and participating in philanthropy. However, I know that Gateways would not be able to exist as an organization to give both the children (and me as one of the volunteers) the experience if there was not someone on the other side who is able to write the checks and help to financially support it. While I may not always be able to give my dollars but can give my time instead, I know there are people who can. JTFGB is teaching me that there are people out there who care to support all different causes for all different reasons and that nonprofits would certainly not be able to exist and operate without those monetary donations. Volunteering at Gateways every week and participating in the monthly JTFGB board meetings has helped me to incorporate philanthropy into my busy life as a teenager in so many different ways. JTFBG has taught me that philanthropy—this love for humanity—needs to have a place in my life, no matter how busy I am. As I’ve brought it into my life, it has taught me how be the leader I have always wanted to be and am still striving to become. It is such an important part of becoming a leader that every teen should have the opportunity to learn about and participate in it before they enter adulthood. The feeling that I get when I am at Gateways and looking at all of the students around me or at a site visit that may be outside of my comfort zone for JTFBG is one of elation and satisfaction. Knowing that I have helped at least one person (and hopefully even made their day in some small way) is the most rewarding feeling ever. This is something that allows me and other teens to be able to help and give back while simultaneously making us feel so happy and improve our own self-esteem and sense of self-worth—without even trying. Philanthropy really is a win-win situation.